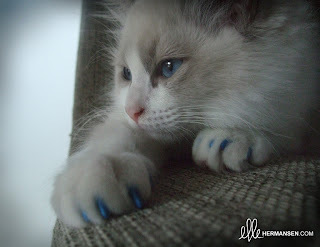 In Norway, it is inhumane to declaw your cat's nails. Did you know that when cats are declawed they actually take out the outermost bone of their "fingers"? I had no idea that they did such a thing, because it is such a normal procedure in Canada. 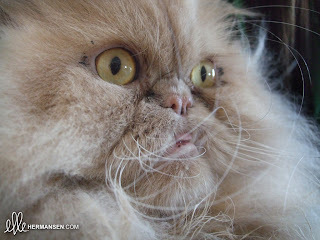 My Persian cat Krang is declawed and fine as he resides in Canada, where he lives to tell cat tales. =^..^= (check out his wise face to the left). Soft Paws are actually nail caps or covers for cats and small dogs. 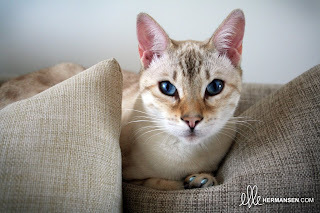 We have been using them here religiously for a year on our cats Beatrix the Snow Bengal and Tobias the Ragdoll (He is wearing dark blue before we switched him to gray on the right ;). We were a little hesitant to try them at first because it just sounded so weird and awkward for them (however, that's a very unbothered Tiny Tobias and me below). I have to say that is the best investment you could ever make if you are against declawing, or if your country doesn't allow it. If it's keeping your furniture intact or you just like the festive colour selection. I promise you, you won't regret it! I love the picture of Krang! I love your kitties pictures too!